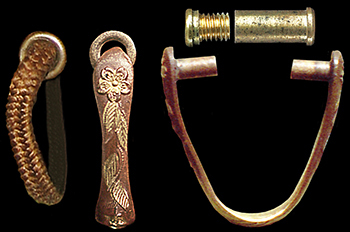 Koberi: "Border portion" of the end of metal fittings. 3, and a Tachi, a pattern is different. (Type 94, 98 and Tachi ). Type 3 is satin finish. as a "round string", there is much metal Sarute. 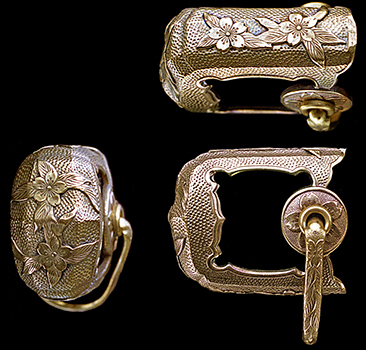 Although a regular guard is gilding at brass, there are various kinds of guard. 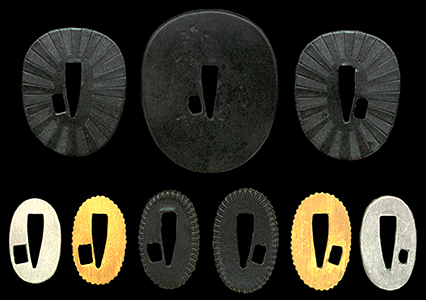 Although a regular large washers is a black rising sun pattern, there are various kinds of custom-made items. The army took in the teachings of the Type 98 Guntō in a battlefield, and enacted the "wartime Guntō" which thought solidity and practicality as important in 1943. Japanese military hard-fight serves as the backdrop, and the army needed to attain saving of goods and simplification of production. The quality of the material of the metal parts was changed into iron, and black paint was hung. 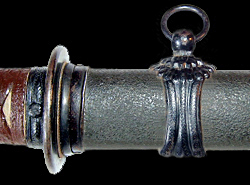 omitted the metal fittings of other scabbard appears. casting. Compared with a guard without openwork, it is profound and splendid. 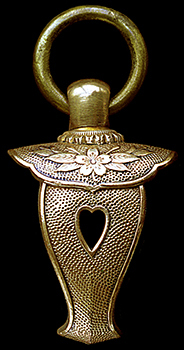 The Guard without openwork: The product made from a brass which appeared from the middle. Quality and a shape change with a production company and time. Metal fittings: The quality of the material is copper or iron. stage, the quality and the gap of a shape like an army Guntō are not. 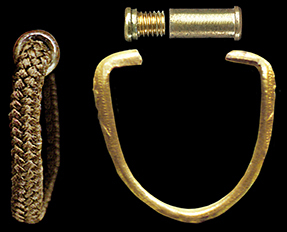 Guard: Product made from a brass casting. excellent quality and an article of average quality processing method of an attachment. 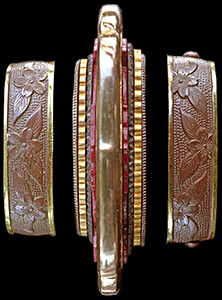 The product made from a round bar: The quality of the material is iron or a brass. Grace is inferior. Informality - a second-half type were equipped. for army Gunto. 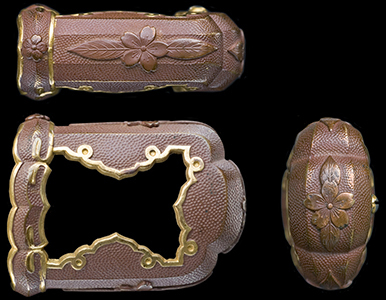 Three cherry blossoms in a round enclosure are the objects for naval Guntō. Type 98: As for the quality and thickness of metal fittings, the existence the screw stop of a "throat" and "chape"
The product made from a closing-in casting and a brass thin board press press fit and paste up. not have a fall like Type 98 Guntō. However, a last stage type is removed. The following identifying point expresses a quality metal parts. 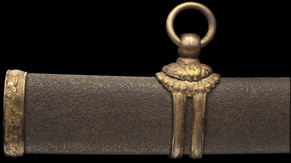 As for the military swords of the early, the regular round string knot loop is attached. Therefore, the quality of a metal parts is good. The thing using the high-class knot loop which has the above-mentioned section also by a metal knot loop is also the same. 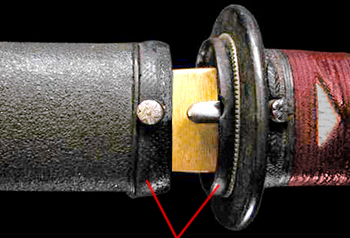 If the large high-class rayskin is used for the hilt , the military swords will use the good metal parts. Four sorts of lefts are 94 and the Type 98 Gunto guard. Quality fell to the right from the left. Other metal-parts quality is proportional to the quality of a guard mostly. The guard of army Type 3 Gunto and a navy does not almost have a difference of quality. Formality regulation: It is copper plating to brass. coating by an amalgam process. paint of brown - dark reddish-brown. Special order: There is also a thing of a black stain. 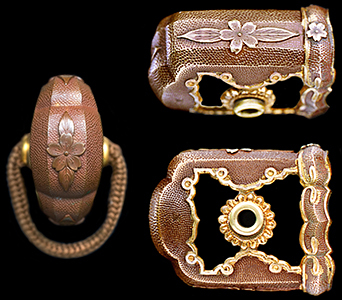 a guard are liquid gold finish by Hera.Two kinds of such golden finish is called Seto plating. The guard of the last stage is still brass foundation. In addition, there are several kinds of things which carried out special order color finish. Large washers: Red - reddish brown paint, or color dyeing. The last stage also has brass foundation. 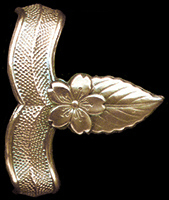 Metal fittings: Seto plating or gilding. Guard: Blue black dyeing or alloy-of-copper-and-gold plating (blue black). 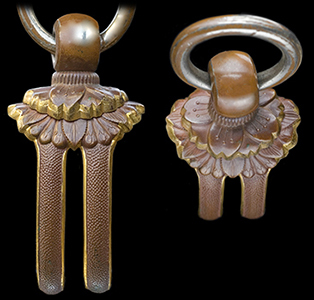 Standard: Rising-sun encaustic ellipse type: Alloy-of-copper-and-gold plating. Special order: There are some which made two colors of gold and brown to the rising sun. 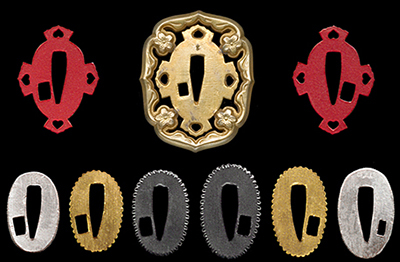 In addition, there is also a Large washers pierced to the pattern of the rising sun. 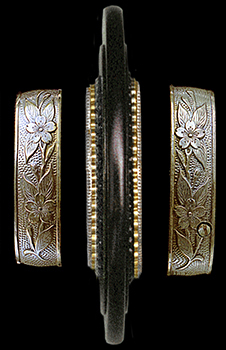 Kikuza: Blue black dyeing, paint or alloy-of-copper-and-gold plating. There is also brown paint. Type 94, 98 and Tachi: Golden coating of an amalgam process or gilding. 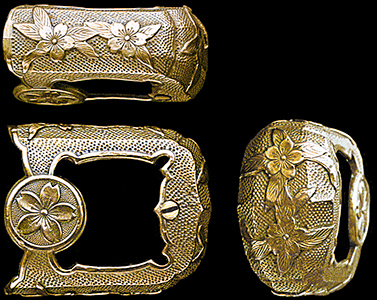 The product made from a casting: Golden coating of an amalgam process or gilding. There is also a thing of copper or brass foundation in a round bar article. It is a golden metal parts altogether. The Type 3 Gunto metal parts is black paint.